1. Yunior says of himself, “I’m not a bad guy…. I’m like everybody else: weak, full of mistakes, but basically good.” Do you agree with his self-assessment…or is he letting himself off the hook too easily? Isn’t his description applicable to anyone? 2. In “Invierno” Yunior and his brother, newly arrived in New Jersey, stare out the window. Talk about the literary symbolism of that act—what “staring out a window” might represent metaphorically for anyone new to this country. 3. Diaz uses two different points of view in his stories—the first-person “I” and second-person “you.” At times he breaks out of the former to speak to readers directly. Any thought as to why—what is the effect of doing so? What about his use of the second-person perspective—is it clever, awkward, or off-putting? 4. What role in this book does the American Dream play in Yunior’s and his family’s new life in America? 5. A pattern of infidelity runs throughout the stories. Why is Yunior compulsively unfaithful to women? Consider the influences of his father and brother—are genetics destiny? Explore the idea of a deeper, metaphorical meaning of betrayal in these stories—a betrayal against the self? And why does Yunior leave a written record of his infidelities? 6. What makes Yunior so compulsively self-destructive? 7. 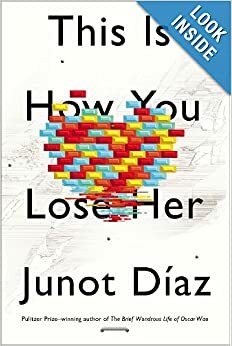 Talk about the final story of this book, “The Cheater’s Guide to Love.” What is Yunior coming to realize? In what way has he changed or matured?